Honey bread is not just for the queen in her parlour. Honey bread is not just for the queen enjoying tea in her parlour. The nectar from the honeybee is both delicious and nutritious. As a beekeeper of some 55 years of experience, taught by my grandfather, please indulge me. I have a passion for this subject! And live alone in the beeloud glade." The difference between raw honey and the crap you buy in the supermarket is absolutely vast. Yes, I'll be crude; it's that important to me as a beekeeper. 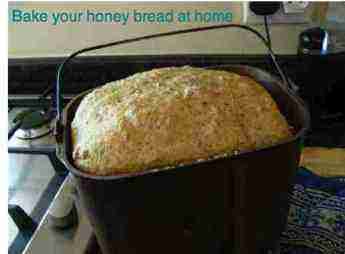 However, when baking your bread, use supermarket honey. You're going to heat it anyway. Here's an aside that may interest you; Grandad, what are you teaching the little ones? Mom and Dad don't have enough time, but you do. There's no greater privilege than handing on our love of carpentry, or bees, or gardening, or music to the next generation; the list is endless. Baking, sewing, making sundials, building a solar array are skills that grandparents can be handing on to the little people; stripping an engine and rebuilding an old classic would be awesome. The number one complaint of teenagers today is that life is boring; how can that be? Grandparents can make such a difference to the lives of their little ones. Mine did, and I still bless them for the rich life I enjoy. Their input made all the difference. My parents were far too busy bringing home the bacon; mind you, my mother did try introducing the Philistine to a little poetry, and some of it stuck. That gem by Yeats is a beauty, not so? It's an awesome privilege to hand on the family traditions to your grand kids be it sailing, or gliding, or just hiking and camping. That's where relationships are built and they learn the value of the great outdoors too. 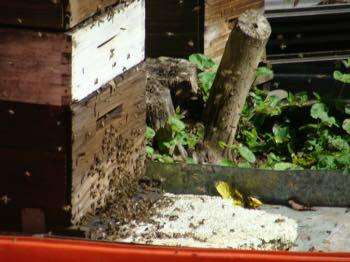 So, it is time to arise and go now to find a small local beekeeper. In the season you could take your own glass bottles, if he will allow it, and buy a year's stock. Take him or her a loaf of your honey bread, and you will have a friend for life; yes, there are plenty of lady beekeepers. Anything a man can do, a woman can do just as well; and often better. Raw honey keeps because of a very important enzyme that releases small amounts of hydrogen peroxide, which kills any bugs. That incidentally is why it's so good for burns, wounds, varicose ulcers, scar formation and tummy troubles; but in fact, since you're going to bake it anyway to make your honey bread, use cheap stuff from the supermarket. Raw honey for your baby remains vaguely controversial. Some paediatricians find it the treatment of choice for diarrhoea, but others claim that babies can get botulism from it. Personally I don't buy into that; botulism is in the soil all around little kids where they probably caught it, and my kids all had raw honey, but you be the judge. Interestingly, beekeeping is becoming the rage in some countries. Whether it's because of environmental issues, or one of the prime ways to relax or a love of raw honey, some folk are taking to this ancient hobby. In fact, if you love nature, and aren't afraid of hard work and a few stings, beekeeping makes a wonderful lifetime hobby or profession. You work very hard for about six months, and then have the other half of the year to go fishing! I could just as easily been a professional beekeeper as a chiropractor; and you can make honey bread several times a week, as I do. Varicose veins in legs causing ulcers can be treated with honey. Honey bread is a favourite; when made with 100% healthy flour, added protein, fat and crushed seeds, you need have no concern of a high glycemic index; one slice only though if you have a weight problem. The bread machine is reputedly the most underused appliance in the kitchen. It's time to wipe it down, dust it off and put it to good use. It takes me literally six minutes to make our honeyed loaf, if you include grinding the one hundred percent wholemeal flour. Loaves of one sort or another are daily on the agenda; more usually our panera bread recipe, which we bake at least five times a week. Often it might be sourdough which is easier to digest if you have gluten intolerance. Six minutes of your time and another five hours for the yeast to do its thing; don't use a shorter time option. And then you have healthy whole grain bread without the chemicals and extra salt the food companies add to their dough. Five minutes when I'm doing it, but six when my granddaughter is measuring and adding the ingredients; she's only seven. That's why she already knows about millilitres and cups, and is getting the gram story down. Could you teach your grandchild to tell the time? It's quite complicated but good practice in counting first up in fives, and then down again. This is my simple bread machine recipe; it takes literally five or six minutes. 1 cup of flour is 240 ml, which is equal to 8 fluid ounces. First the dried yeast goes in the bottom of the baking tin; then the flour, salt, cinnamon and ginger. Beat the egg and milk together, and pour the mixture in. Figure the settings and in five hours you have delicious honey bread. Cinnamon incidentally is immensely healthy stuff. Lots of research showing that it helps reduce the glycemic index of foods, which is quite high in bread; one Danish researcher showed that, together with raw honey, cinnamon enabled disabled people with arthritic joints to be able to walk again within a month, and it lowers the bad cholesterol. Or, if you have the time and energy for doing it the old fashioned kneading, but immensely rewarding way, here is another recipe. Baking with yeast and kneading the bread is not for the faint hearted. Having personally done it for years, I would recommend the beginner start with this easy recipe. Oddly, in South Africa, it's the price of electricity that's killing baking in the oven. So I changed to the bread machine, not just because of the time saving, but because I can run it off our solar generator. Even now I can smell the wonderful aroma of our honey bread drifting up the stairs from the kitchen. Sift the dry ingredients into the bowl of an electric mixer. Beat the eggs, then add the milk and honey to the eggs and beat them together. Add the mixture to the dry ingredients and beat well for at least 15 minutes but preferably 30. Butter two 8 inch loaf pans and divide the batter between them. Bake for 40 50 minutes. The honey bread loaves will be puffed and golden when done. Be a queen and make sure the king gets some of the royal food too. Watch out for the blackbirds! Beekeepers have a good working relationship usually with a local chiropractor. 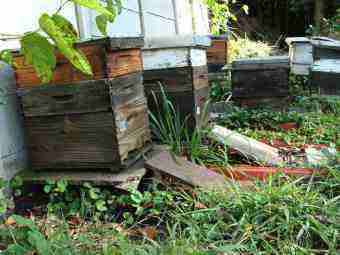 Honey is heavy stuff and most often lifting whilst bending and twisting is what does the back in. As when lifting pails of honey from the extractor, or supers full of the sticky stuff. Good chiropractic will sort it out, but an ounce of prevention with exercise and sensible ergonomics makes a lot more sense. For more about back exercises, sign up for our chiropractic tips, or look in the navigation bar. Wounds in general, and varicose ulcers on the lower legs in particular, respond very well to a proprietary gel called Melladerm that is largely raw honey. Honey has the capacity by osmosis, due to its very high flower sugar content, to extract water from the wound and promote healing. Remember, if you are going to eat honey regularly, and you should but in small quantities, then find a local beekeeper and ask for the raw, unheated stuff straight from the drum. The taste alone will tell you the difference. Why should we enjoy it only in small quantities? Because refined bread flour has a high glycemic index. Do you know what that is? You should if you have a weight problem. Understanding glycemic index is the simpler way to get your weight under control. There is no easy way; if your BMI is over 35 then I'm afraid you have to cut out honey bread completely. Otherwise death will be knocking at the door; literally. The machine certainly makes baking honey bread a cinch, and it's good healthy food. 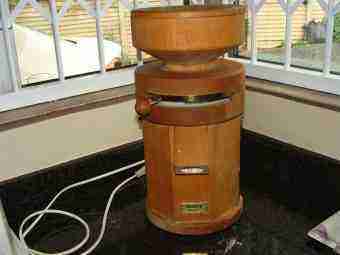 But if you want to step to the next level of baking, then you really need healthy flour and that's more schlep; a little more, but some expense as it means purchasing your own wheat grinder, and they're not cheap. $200 and up, and if you want it ground finely, then it's best to buy from the top of the range. My Havo is twenty years old and perfect, and used almost every day. Don't be fooled by the "wholemeal flour" in the supermarket. Millers are allowed to remove up to 40 percent of the bran and germ, the best part, and still describe it as whole grain. But true whole grains researchers are finding have an extremely important role in the heart stroke diabetes saga; nearly 50% of these folk unnecessarily long before their time. The reasons are complex but answered in part by the question does flour go bad? Yes, wholemeal flour will go rancid. Look for 100% wholemeal flour, or grind your own. Smart bran is often recommended for lowering cholesterol; I consider it inadvisable, partly because of the phytic acid that binds up to half the calcium, iron and other minerals in the meal and partly because it's a poor substitute for enjoying healthy flour every day. Your honey bread made with 100% wholemeal is the real deal. If you want good quality nectar, and one of the finest escapes from the stresses of life, then how to start beekeeping should be one of the items in the to do jar. Live in a bee loud glade, and enjoy the wonders of honey bread every day! I do. Chiropractic help is a site for those wanting to improve their health, first by understanding your body, and then eating better, and exercising more. Honey bread is one tiny part, and makes a great meal when made with 100% flour and enjoyed in the context of creating a divine green salad. 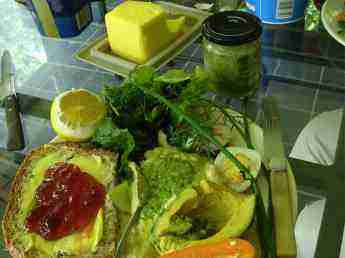 To go from HONEY BREAD back to HEALTHY LIVING TIPS home page. Easy sourdough bread recipe - it's more digestible.